Don’t throw out those old clothes! Here are 5 clever things you can do give new life to your unwanted clothes the next time you’re cleaning out your closet. If you’re on a mission to organize your home, your closets and dressers should definitely have a place on your list of spaces to tackle. It’s easy for unworn clothes to get pushed back into the corners and become entirely forgotten about, and you might be surprised by the sheer number of items lurking in your closet that you’ll simply never wear again. Luckily, there are plenty of ways to give new life to your unwanted clothes. If you could use a little extra cash in your pockets and your unwanted clothes are in good condition, consider selling the stuff you won’t wear again. While you likely won’t earn back the money you paid for your items originally, you’ll likely recoup a few bucks in the process and help someone on the hunt for a great deal secure clothes at a discount. When it comes to selling clothes you no longer want, you have a few options. If your wardrobe purge occurs during a warm month, consider a yard sale or garage sale. The tricks to a successful yard sale are location, design, and advertising. Make sure your yard sale is located in a prime location seen by lots of walkers or drivers. Organize it so it looks like something people want to stop and look at. And advertise like crazy! Make sure signs are legible and easy to read from the road. Consignment shops will often pay you cash for gently worn clothes they can sell again. You can also cut out the middleman and post your tops, jeans, and scarves for sale on Facebook Marketplace or Craigslist. 2. Donate them to a good cause. If you aren’t in need of the extra cash or just don’t want to deal with the headache that comes with trying to sell all of your unwanted clothes, you can always donate them to an organization that helps those in need. Depending on what you’re looking to offload, consider donating your old clothes to specialized charities. Of course, there are always the “catch-all” organizations that accept anything. This is like Goodwill, Salvation Army, and the clothes drop-off bins. There are also niched organizations that focus on supplying athletic clothing and prom gowns to teens in need, suits and business clothing to disadvantaged job-seekers, and gently-used wedding dresses to women who simply cannot afford one. So do a little research. See what you have and try to find a place that needs it. 3. Trade them with friends. If you have some friends with similar fashion sense, consider setting up a fun night to swap clothes. Ask everyone to bring over any pieces they’re willing to part with (and a bottle of wine!) and shop one another’s closets. You’ll get rid of some things you’ll no longer wear and add a few new items to your collection, and you’ll keep your unwanted stuff out of the landfill. What if you aren’t the same size as your local friends? You can always use social media to reach out to friends that live far away and shop each other’s closets over video chat and mail the clothes. Oh the power of technology. Feeling a little crafty? With some sewing skills, a stapler, or a hot glue gun, you might be amazed to see all the different things you can create. Convert your old t-shirts into shopping bags, sweaters into quilts and old pajamas into cleaning rags or even a scrap fabric wreath. 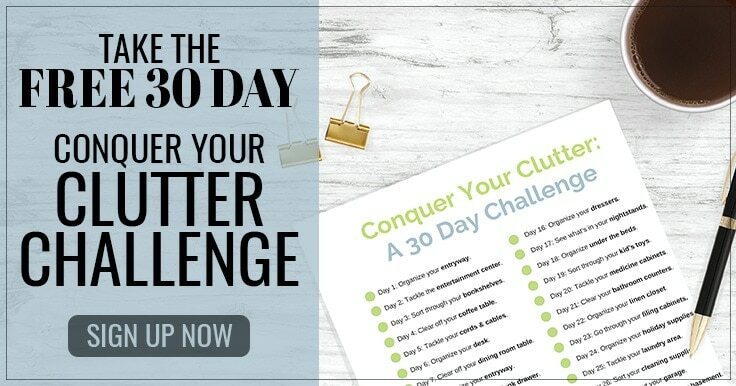 You can find dozens of tutorials on Pinterest or simply experiment on your own! Many people don’t know it, but many fabrics and items of clothing can actually be recycled and repurposed in useful ways. The American Textile Recycling Service is committed to this mission and is available in ten states across the country. If they aren’t active in your area, any North Face store will accept items to recycle through their Clothes the Loop program. 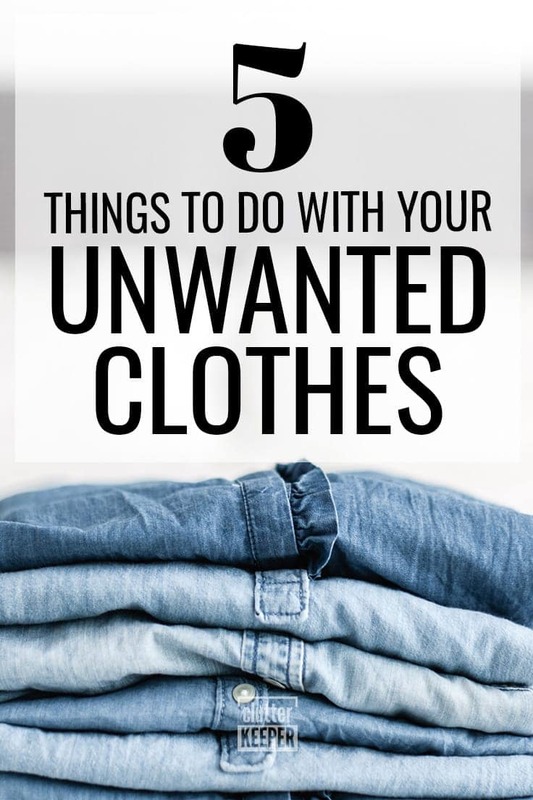 Depending on the quality of the clothes you no longer want to wear, you have quite a few options when it comes to getting rid of unwanted clothes. Do you have a favorite charity or secondhand shop that didn’t make this list? Leave a comment and share below! 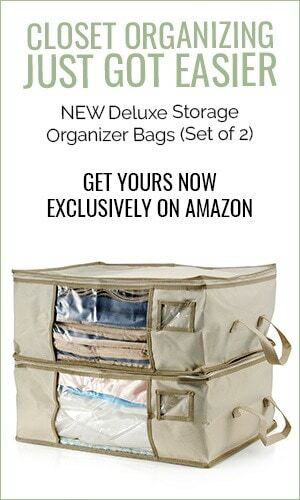 Now that you got rid of your unwanted clothes, are you ready to organize more stuff? 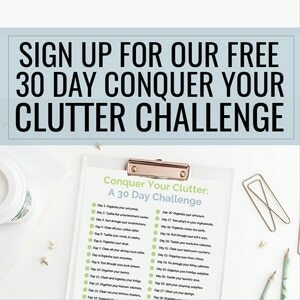 If so, Clutter Keeper has some fantastic articles to motivate you and give you some helpful tips too!